Early Beginnings: Being born in 1942 had much to do with my becoming a science fiction enthusiast. On September 8th, 1944, the first V2 rocket was launched toward London. Six years later, the V2 appeared again in George Pal's motion picture, "Destination Moon." Theaters were big in those days, the V2 was big, and "Destination Moon"  WOW, that was really big! Three years later, George Pal flattened Los Angeles with "War of the Worlds" and I was hooked! The truly great thing about the 1940s and '50s was that because the general public knew so little of science and technology, which were primitive by today's standards, the fantastic stories of science fiction novels and motion pictures seemed entirely credible. Invading Martians, mutant giant ants, sophisticated robots like Gort, and interstellar travel were ideas that most people accepted without question. At the age of nine I saw Howard Hawks' "The Thing" on the big screen and got so scared I stayed awake all night, even though I had closed my eyes and covered my ears during the most terrifying scenes. It sure seemed real to me! The next day I had to go back to our local movie house, the "Bug," to see what I had been too terrified to watch the day before. As a kid I read all the Heinlein I could get my hands on, watched "Science Fiction Theater" every week on a relatively new invention called "TV," and virtually lived in Chicago's Adler Planetarium on weekends. Clinging to my grandmother's roof, I saw Sputnik fly over in 1957, and while NASA was busy blowing up its rockets, a schoolmate and I launched our own, frequently with greater success. In 1957 Selby Maxwell, a retired meteorologist who had built his own observatory, let me and a boyhood friend observe Mars when it was in opposition. For several nights we took turns sitting on the observer's scaffold, peering into the eyepiece and sketching the Martian surface, just as Percival Lowell had done more than 50 years before. Medical Research: After leaving the army I worked my way through school, holding down a wide variety of jobs: hospital orderly, security guard, ambulance attendant, zoo keeper, orthopedic technician, reference librarian, phlebotomist, freshman biology instructor - whatever I could get (the cab driver career lasted a day). I finished college with an M.A. in biology, and after three years in lipid research, joined the department of anesthesia at the University of California Medical School in San Francisco. By 1988, I had finished a number of research projects and co-authored 13 papers, most of them on what was then the leading edge of transesophageal echocardiography. While doing a study in the operating room I met a patient by the name of Robert Heinlein. After his surgery we had a very interesting conversation! Painting: At the age of five I discovered Crayolas and filled in every coloring book ever made, but before long found the best medium to be plain old paper and pencil. I drew ships, airplanes, trains, people, church steeples, roller coasters, and course  rocket ships, anything that had lines of interest. Art was always my favorite class in grammar school, and while in military school I spent many a quiet weekend sketching. By the time I reached high school, drawing had become an infrequent pastime and while in the army and in college I stopped altogether. During my years in medical research, however, following long, tense days in the operating room, I began drawing and painting again, just to unwind. To my great surprise, some of my office mates began to commission pieces, and before long I realized that I had a career change to consider. The world of "real science" is not a place for the incurable romantic; it's tedious and relatively uneventful,. So, in 1988 I left medicine to paint full time. In 1989 I joined the Artists' Guild of San Francisco and began showing in city parks. Everyone was painting cable cars, seascapes, little kitties and fishing boats - everyone but me. Although they juried me in, the members of the guild didn't seem quite to know what to make of my work. In 1989 I showed at my first science fiction convention. Today I show my paintings at science fiction/fantasy conventions and sell my work through galleries, shows, publishers and auction houses. As I paint, I once again explore the magical universe of my youth, and sometimes, late at night, when all is quiet and the sky is clear, I lay down my brushes, step outside, and search the heavens for the first wave of Martian war machines  I know they're coming. Fencing: Since childhood I had been interested in swordplay and took up fencing in 1964. I was a successful competitor, but by the time I entered graduate school I had no time to compete. Once I entered medical research I fenced sporadically, but my career eventually interfered with my training and with competition schedules. After leaving the university, I once again had time for fencing, but this time chose to study to become a fencing master. Following a three year course of study, I passed the final examination in 1996. For six years I served as assistant director of the fencing masters training program at San Jose State University. I have been master of my own fencing school, La Spada Nimica since 1990. At science fiction/fantasy conventions I frequently give lecture-demonstrations on the theory and technique of classical Italian foil and saber fencing, as well as lectures on "sharp force injuries" and dueling. I have been a member in good standing of the Italian Fencing Masters Association since 2002. Awards and Honors: Over the years I've been pleased to receive a total of thirty-four awards from science fiction/fantasy art shows and others in which I've shown my work. 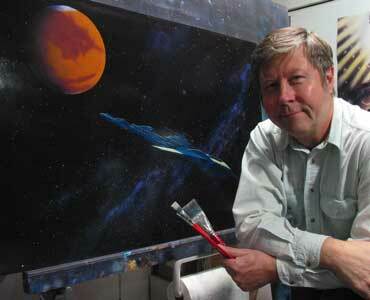 In addition, I've been honored to serve as Artist Guest of Honor at Baycon, Starquest, Orycon and Westercon. Worlds of Wonder Gallery  Washington, D.C.